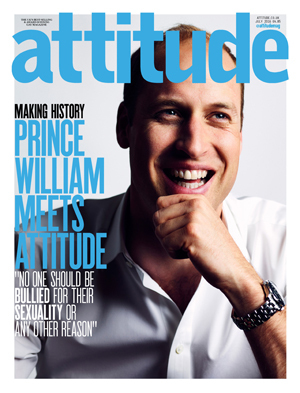 Prince William has spoken out about the impact of homophobic bullying on mental health after becoming the first royal to appear on the cover of leading gay magazine, Attitude. In May, the duke invited the magazine to bring members of the lesbian, gay, bisexual and trans (LGBT) community to Kensington Palace so that he could listen to their experiences of bullying and the effects it can have on mental health. Speaking to Attitude, the duke called on young people being bullied for their sexuality to seek help. ‘No one should have to put up with the kind of hate that these young people have endured in their lives,’ he said. Research published in 2015 showed that a third of young lesbian, gay or bisexual people and 48% of trans young people in England had made at least one suicide attempt, compared with 18% of young straight people. Around 57% of LGB young people and 85% of trans young people had self-harmed at least once, compared with 38% of young heterosexual people. During the Kensington Palace meeting, members of the LGBT community said how being bullied had led to low self-esteem, suicide attempts, eating disorders, depression and drug addiction. In April, the duke set up a taskforce to tackle cyberbullying and, with the Duchess of Cambridge and Prince Harry, has launched the Heads Together campaign on mental health and wellbeing.